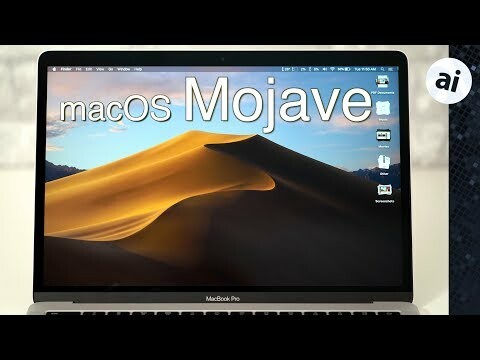 The next version of the Mac operating system, macOS Mojave, will be officially released on Monday, September 24. From that date it will come out of beta testing and will also be pre-installed on all new Macs. During his closing remarks at this year's Apple Special Event, Tim Cook said: "We've got a great new update for the Mac with macOS Mojave. All-new Dark Mode, updates to Desktop and Finder. Enhanced privacy and security and a completely redesigned Mac App Store." This timing is on a par with last year's macOS High Sierra which was featured in the September 12, 2017 Apple Special Event and launched on September 25. Apple released the "gold masters" -- or last version before release barring any disasters -- for user testing after the "Gather round" iPhone event. Mojave has already been in both developer and public beta testing since shortly after the WWDC keynote in June. AppleInsider took a look at the first beta release. Since then we've learned that a key feature of both macOS Mojave and iOS 12, Group FaceTime, will not ship with the September launches. It will be added in a update later this year. Will it be rick solid on fusion drive imacs??? Still have not upgraded because of this glitch . Some features existed on old Mac OS X and including in QuickTime paid version including trimming. Apple does not innovate here except moving features around to be part of OS. Organization in stacks was also there for download folder just that now it is relocated and on Desktop and multiple stacks appearing in different facy way. I suspect that some of hype driven guys at Apple assume that we just started using Mac and never used it before. Well I can say what was in Jaguar many years ago as I went through all of those versions (well I skipped few as they were useless to me). All this is good, but please do work on more advanced features. OS is not an editing platform for multimedia. I can (and I did) use advanced applications for this. For example I will not resign from editing with Luminar which is way superior to Photo or preview rotation feature for low cost and used by professionals. Same is with video editing as now you can find many free editors that outperform iMovie or Quicktime-fashion functions built into OS. The dark theme is good, but Apple seems to keep forgetting that it is still useless for people with impaired vision. Please improve font managment so people could decide for bigger system/desktop fonts (large screen resolution does not mean you want to squeeze more tiny print that it is hard to read and nobody says you should need reading glasses to work with computer either). Only one app on market so far manages that and Apple even did not think to build it into OS I guess (well it is there, but no management for this is clearly visible as app or utility). I've been using Mojave on my iMac with 3TB Fusion drive with no problems. It's running APFS. I also have Mojave on a hard disk equipped Mac Mini and it's also running fine with APFS, although a bit slower than the Fusion equipped iMac. The only issue I have run into on the iMac with Mojave is that Time Machine has experienced very infrequent errors when trying to use an external Western Digital hard disk drive on USB3 with the hard drive formatted with Mac OS Extended. The same iMac has no problems whatsoever with Time Machine using a Lacie Thunderbolt hard drive formatted with Mac OS Extended. I was freaked out about APFS and Fusion compatibility based on the terrible experience I had with the first beta of High Sierra on my Fusion equipped iMac. A year later, it appears that Apple got everything resolved with Mojave.